Are you staring down a page full of o-chem line drawings? Help is on the way! It may look like the Zig-Zag Army decided to take on the Union of Stick-Figure Spacemen, but line drawings save you a lot of time in organic chemistry. It just takes a bit of know-how to learn what they mean—and a bit of practice to use them like a pro! Just like you learned in highschool, elements are happiest when they have eight electrons, and they form molecules in order to get eight electrons, even if they have to share with another atom. You can tell how many usable, outer electrons each element starts out with by which column it’s in on the periodic table. Oxygen starts out with six, carbon has four, hydrogen has one, etc. To make things easier, bonds between atoms (two shared electrons) are represented with a line. That gets tiring to write out over… and over… and over. And you’ll be doing plenty of writing over the course! So the first shortcut is to hide the hydrogens, because we already know that carbon needs 8 electrons. 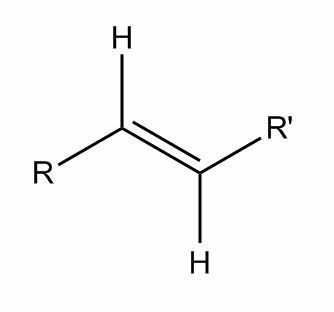 If there’s a carbon at the end on its own, we know it needs three hydrogens. If it’s in the middle of a chain, we know it needs two to be complete. Still C4H10. Three hydrogens are hidden on the left, three are on the right, and two are on each carbon in the middle. The beginnings of a hangman game? But that just looks like three lines, which could get confusing. 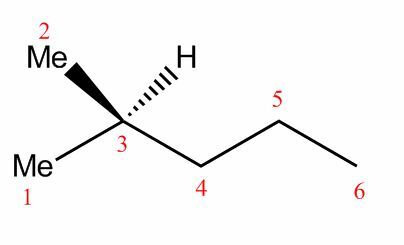 So we take the three bonds, and we angle them, understanding that there’s a carbon at each end of every bond. 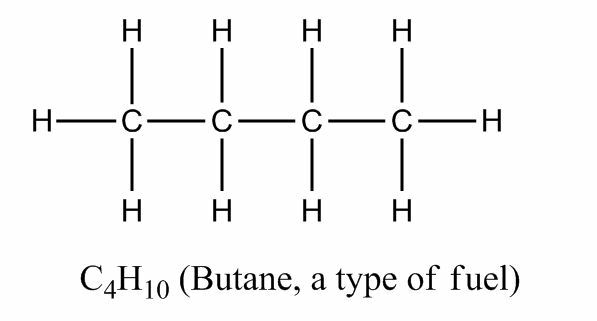 This is no longer necessarily butane—the R could be anything from dozens of carbon atoms to rings or other elements. Each assignment will usually specify what “R” is if it’s important. This system can include other atoms too, as well as different kinds of bonds—single, double, triple, or even quadruple. A really complicated molecule with a ketone group on the left (C double bonded to O), a double bond in the middle, and an ester on the right side). You also hide the electrons on the oxygens for simplification. This could be the same molecule as above – R represents the ketone, and R’ is the ester. 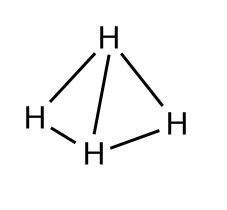 See how there are only two total hydrogens in the middle because of the double bond? This way, all the bonds are 90 degrees apart. But remember, molecules are 3D, not 2D, so they can actually get even further apart if one hydrogen moves a little bit forward and another moves a little bit back. Line drawings use a solid line to show something sticking forward out of the page and a dashed line to show something pointed backwards. It can be hard to picture at first, so it’s worth making a model (even if it’s just with marshmallows and toothpicks). It looks like a tetrahedron or a pyramid with the carbon in the middle, so it’s called the tetrahedral structure. 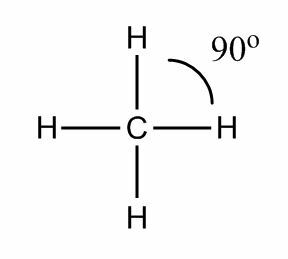 There are two Me groups—two CH3 groups—on the left end, plus three carbons and five hydrogens in the chain, and one last Me group on the right (the Me wasn’t written, but it’s still a CH3 because that carbon needs three hydrogens). That adds up to a total of six carbons and a whopping fourteen hydrogens! Did you spot them all? (Normally, that hydrogen in the middle wouldn’t have been shown—only the Me group—but we put it in to make it a bit easier). It takes some getting used to, but all you need is practice. Keep working at it—drawing random diagrams in your spare time is encouraged—and you’ll be scribbling out diagrams like the best of them in no time! P.S. These aren’t useless, we promise! Oh… You wanted to know what these are used for? Later on in your chemistry career, you’ll be using these do draw out mechanisms—the way organic molecules interact. As described in an earlier post, negative charges are attracted to slightly positive charges. 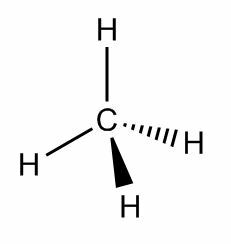 If you have a ketone, for example, the oxygen hoards a lot of the electrons, giving it a slight negative charge and the carbon it’s bonded to a slight positive charge. If you add a base—something with a negatively charged atom—the negative charge will “attack” the positive charge, forcing the electrons to move around in order to maintain the eight-electrons-means-everyone-is-happy rule. Arrows are used to show the electron flow. Add an acid at the end, and you neutralize the extra charge! 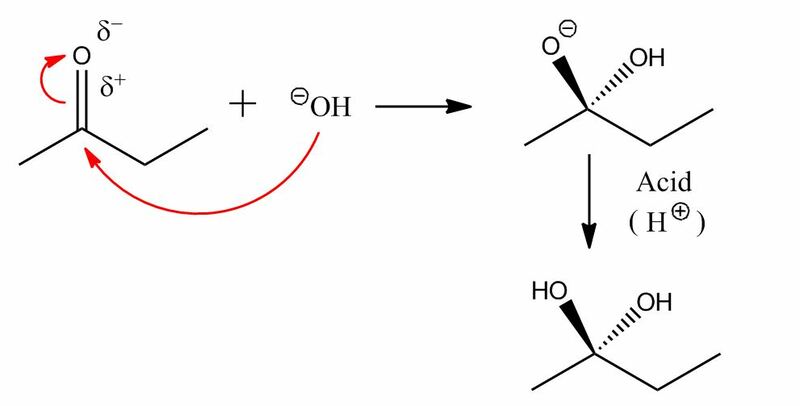 If you had used an OH group that had a functional group attached, you could even merge two molecules to make an entirely new molecule—and that’s one of the ways organic chemists synthesize new compounds. Eventually, you’ll practice doing a lot of these, starting with several famous “named” reactions. If you can get a “feel” for where the electrons are going, you’ll have a good chance at being able to solve whatever chemical problem the exam—or your future research—decides to throw your way! So don’t give up. It looks overwhelming at first, but line drawings are a huge timesaver—and hugely important in the development of everything from life-saving drugs to new, earth-friendly plastics. Stick with it! 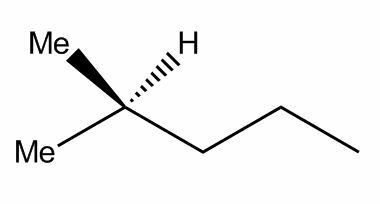 It’s really important to practice with some models, because drawing organic compounds can be extremely important. Some drugs only work if they are all one stereoisomer—one particular arrangement of atoms. Our lecture set on Organic Chemistry has some more great examples and detailed information about structure, acid-base reactions, and stereochemistry.